The UN has launched an appeal for $613m to help people affected by Israel's military offensive in Gaza. 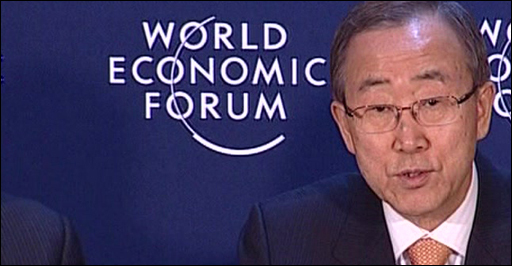 "These needs are massive and multi-faceted," Secretary-General Ban Ki-moon told the World Economic Forum in Davos. He added that funds would be used to "help overcome at least some measures of this hardship". 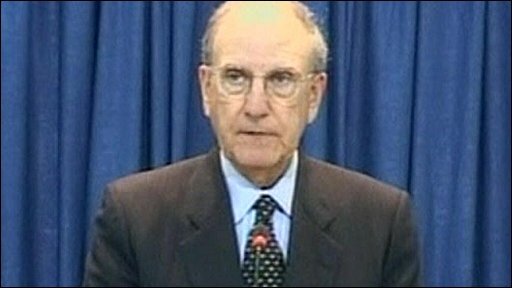 In the region itself, US envoy George Mitchell said the Palestinian Authority should play a part in cementing the Gaza Strip's shaky truce. After meeting PA President Mahmoud Abbas in the West Bank, Mr Mitchell said a "mechanism" was needed to stop arms smuggling into Gaza, and that should be done "with the participation of the Palestinian Authority". Mr Ban visited Gaza after the ceasefires - the first world leader to do so since Hamas took over in 2007 and Israel tightened its blockade - and he spoke passionately about what he had seen there. "More than one-third of the 6,600 deaths and injured were children and women. As a father of three I was especially troubled by the suffering and trauma that so many families went through," he said. "People have lost their families, they have lost their homes, belongings, and livelihoods. Schools, clinics, factories and businesses have been destroyed," he said. BBC diplomatic correspondent Bridget Kendall in Davos says Mr Ban's appeal was impassioned and hard hitting, and he stressed it was humanitarian rather political in nature. The appeal aims to cover the requirements of the UN and other aid organisations for the next six to nine months and will provide everything from medical care to clean water. The Israeli offensive in Gaza killed about 1,300 Palestinians, of whom 412 were children; 21,000 homes were destroyed or badly damaged. Thirteen Israelis were killed during the three weeks of violence. Also at Davos, the UN Office for the Co-ordination of Humanitarian Affairs chief John Holms said Israel had to lift its blockade of the Palestinian territory of 1.5 million people. "We're asking for the crossing points to be opened fully... Otherwise, we won't be able to achieve what we want to achieve," he said at a joint news conference with Mr Ban. 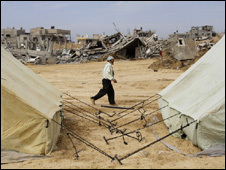 Israel says restrictions on access to Gaza are necessary to prevent the flow of weapons to the Hamas movement. Mr Mitchell visited the West Bank on Thursday for a meeting with Mr Abbas, whose Fatah movement is at odds with Gaza's ruling Hamas party. "To be successful in preventing the illicit traffic of arms into Gaza there must be a mechanism to allow the flow of legal goods, and that should be with the participation of the Palestinian Authority," Mr Mitchell said. "Lasting peace is our objective and the United States will sustain an active commitment to reaching the goal of two states living side by side in peace, stability and security." On Wednesday, Mr Mitchell met senior Israeli officials in Jerusalem, after beginning his first tour of the region as President Barack Obama's envoy in Egypt. Mr Mitchell has no plans to meet representatives of Hamas. The announcement came amid fears of a collapse of unilateral ceasefires by Israel and the Hamas militant group. Sporadic violence has erupted since both sides declared tentative ceasefires on 17 and 18 January. Late on Wednesday, a rocket was fired from the Gaza Strip into Israel. Israel bombed the area around the border between Gaza and Egypt. Another rocket was fired on Thursday morning, while Israeli air strikes hit southern Gaza. Meanwhile, about 40 demonstrators protested outside the BBC offices in Gaza. Representatives from a dozen intellectual and cultural groups called for a boycott of the BBC, in protest at its refusal to screen on UK television a humanitarian aid appeal for Gaza and for what they describe as "unbalanced reporting".